In the deep deep distant past of the 1980s, I used to have a subscription to a magazine called Pins and Needles. Oh how I loved it! I was a young parent with small children, a marriage on the rocks and a very isolated rural existence in a small Devon cottage. The monthly arrival of Pins and Needles was in many ways my salvation. It had so many exciting projects and articles in it! 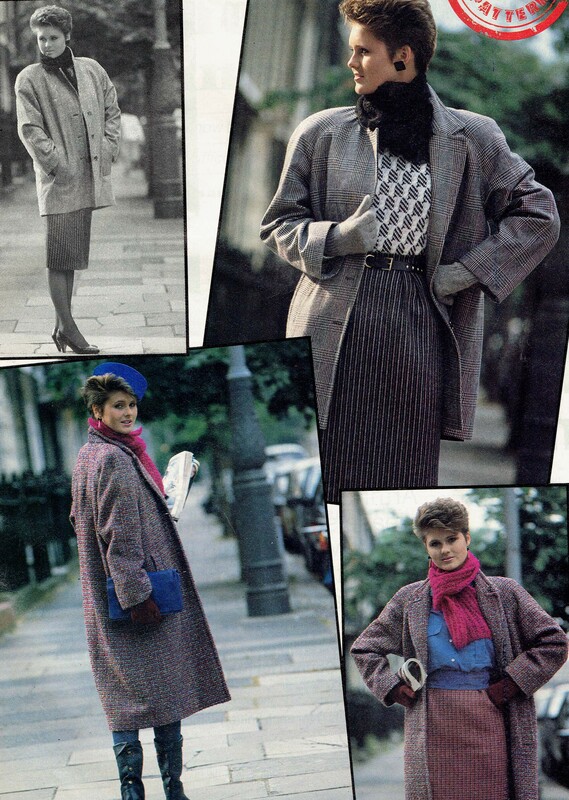 Of course, I couldn’t afford to make most of the items featured in it – nor would the cool 80s hairstyles and shoulderpads have been very relevant to my rural existence if I had been able to adopt them. But I could dream….. and just occasionally an article would spark me into action. 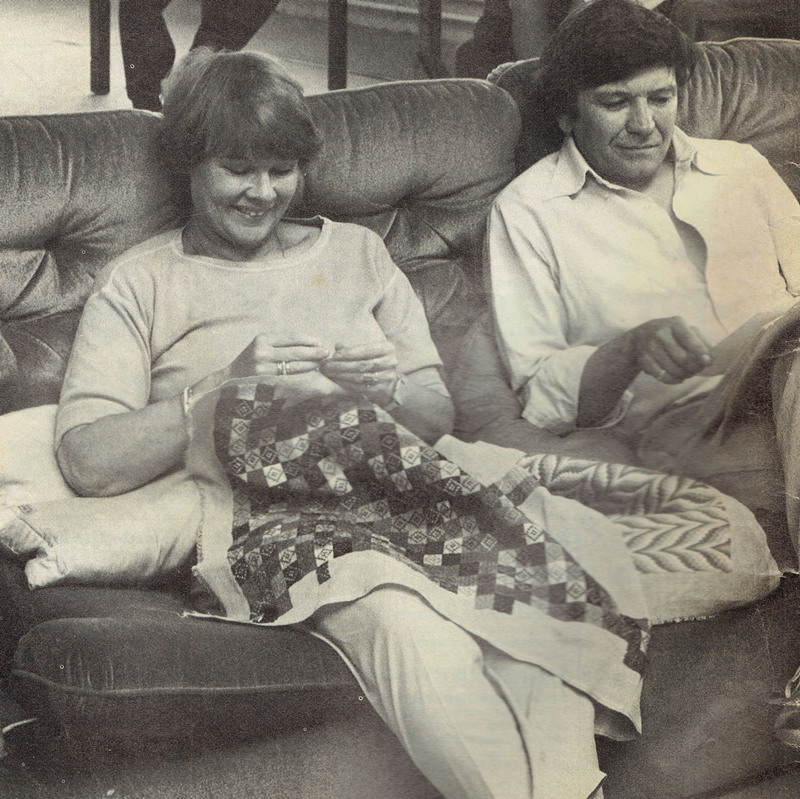 One such article was an interview in the September 1983 issue with Judi Dench about her embroidery. It’s a lovely article. She was rehearsing at the time with her husband, Michael Williams, for the television comedy series, A Fine Romance. In breaks, her embroidery would come out and she would stitch away. According to the article, all the designs were her own, and her production rate was so prolific that she would give away her finished designs to other actors, her little Hampstead cottage being far too small to house all her work. I was very taken with this pattern, and it stayed in mind until many years later (in the 1990s) I was looking for a travelling embroidery project. From the picture below, I was able to work out the basis of the pattern. 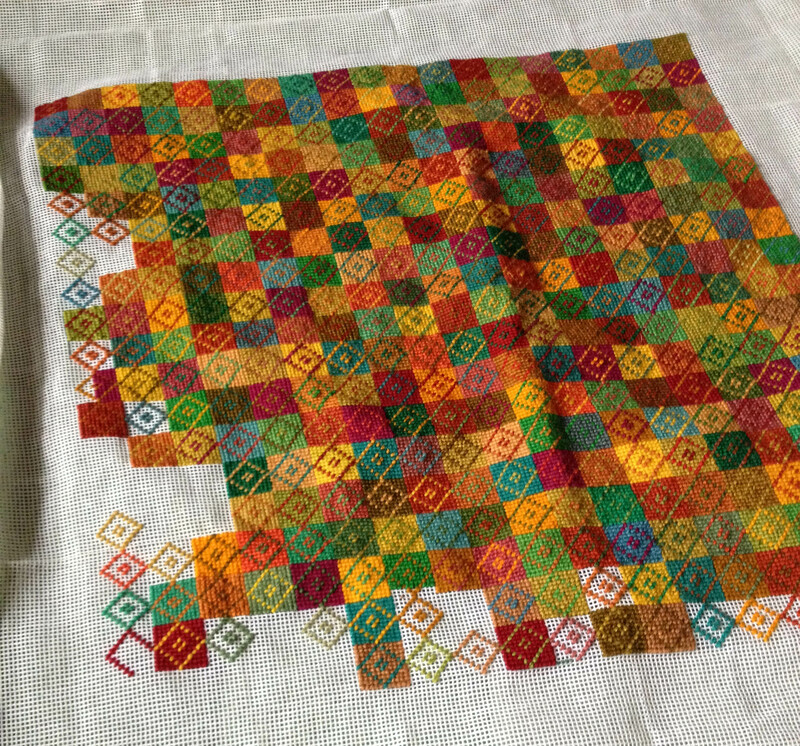 I’ve no idea what colourway she was working in, but mine was to be orange, yellow, green, red and a little brown – oh, and some fuchsia for “lift”. The embroidery travelled round with me for a while, but then it fell into disuse, and I realised that I preferred to take knitting with me rather than this embroidery work. It’s rather a sad reason why this had occurred. 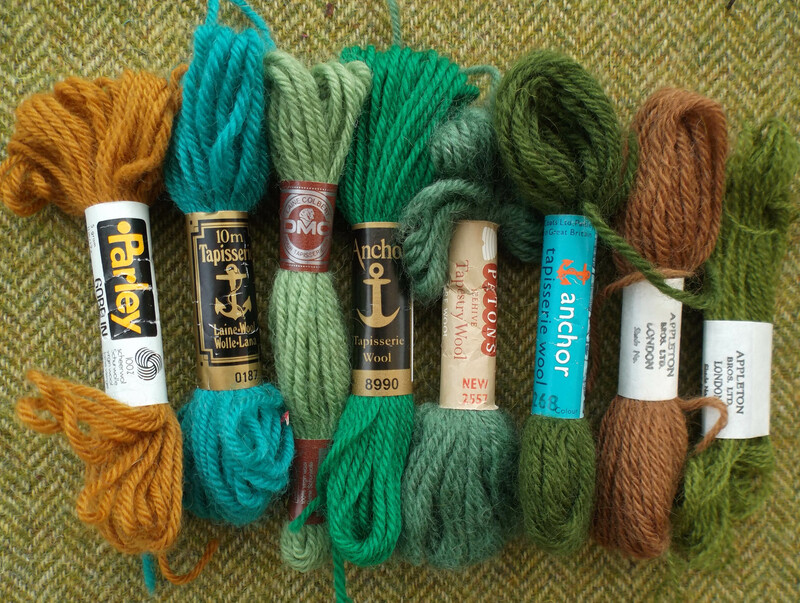 I’d chosen to do my embroidery in a great range of colours, many of them very close to each other. And I have to admit that now I am in my 60s, I can no longer see the colours so clearly – except in clear daylight. In trains, other people’s darker homes, I just couldn’t make out exactly which shade of red or green I needed. It’s a particular problem for me even at our own home when the days are grey and dark. 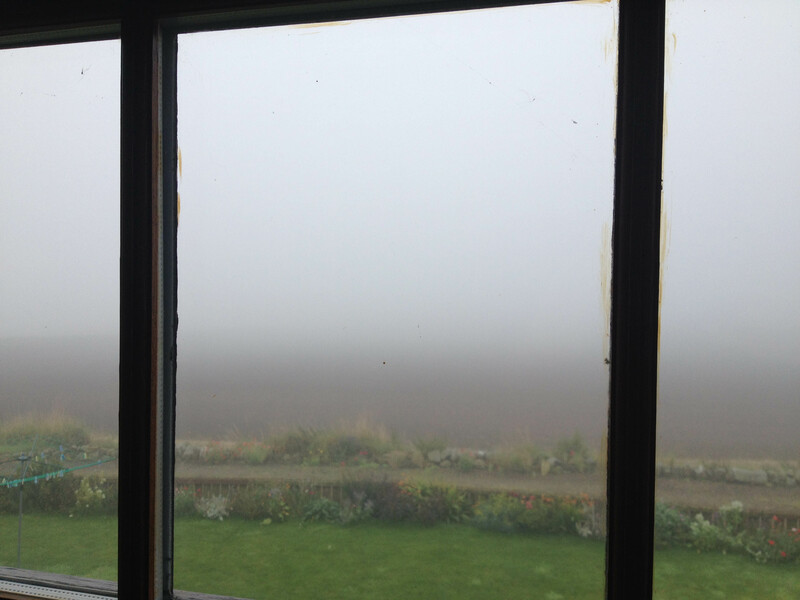 We have small windows, and when there’s very little sunlight outside – it’s pretty grey inside too! When I was a teenager, my family would work on a large jigsaw puzzle together over the Christmas holidays. And how clearly now I remember my mother lamenting that she could not see well enough to distinguish between subtle colours under electric light. My turn now. I will have to embark on another Judi Dench-inspired embroidery one day, if only to incorporate some interesting words! For now, here is my completed and anodyne cushion. It fits very well in with the other cushions on our sofa. 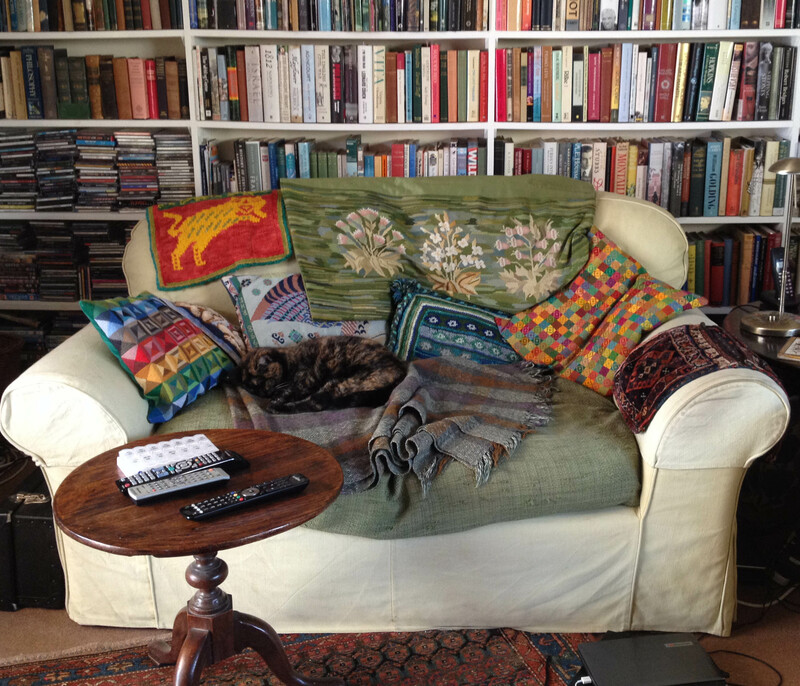 Actually – the sofa usually looks more like this. Well – it’s sort of comforting to think that you know grey and dreary too, Joan! Not that I would wish it on anybody – but if you’ve got a friendly animal to cuddle up on the sofa, it’s very good. 🙂 Thank you for your kind words on the embroidery and so glad you enjoyed the post. Pretty fabulous that Judi Dench does handwork and that you were inspired to make ‘her’ pillow. It looks fabulous – like a Paul Klee painting. And what a great mother you have, to leave you so much raw material to work with, presorted!! Lastly, it was a relief to see your foggy view – sort of a relief from all the sunny photos (you can tell I am a Seattleite by that comment). We are socked in occasionally here in the winter too but I imagine it wears on you if the grey days run together. Lovely praise to say my embroidery is like a Paul Klee painting – thank you so much. and actually, it’s people like you saying how wonderful my mum is to have given me this stuff that makes me appreciate it properly – it is sort of terrible what you take for granted in families, isn’t it? I’m glad somebody enjoyed my grey view! – a run of grey days really gets me down, but I do appreciate that a run of scorchers or heavy snow can do the same. I love it! It is beautiful, but it is also a great story of connecting with your family members, using up collected supplies, and finishing a project! Thank you, Textile Ranger – so glad you enjoyed all the bits and pieces that went into this story – I just can’t believe how many years this project has been in my mind if not in my hands. It is so very satisfying to have finished it off! Oh what a lovely story! As a total Judi Dench fan, and having no idea about her other activities, this was so much fun to read. And to find the origin of that beautiful tapestry I saw you working on in the summer was so far back, and from her! As someone else said, the before and after pictures of the sofa are great. 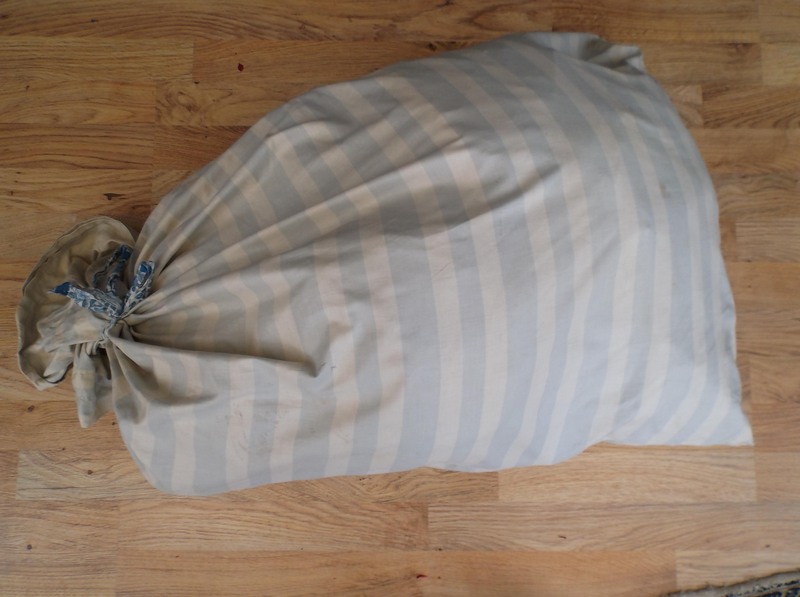 Also poignant, your mother leaving all those wools so neatly wrapped, so careful in the present and thoughtful for the future. How strange that I never mentioned to you that it was a Judi Dench inspired design when you saw me working on this embroidery, Polly! I guess I didn’t know you were such a fan – and isn’t it intriguing how little known it is that she does all this embroidery? 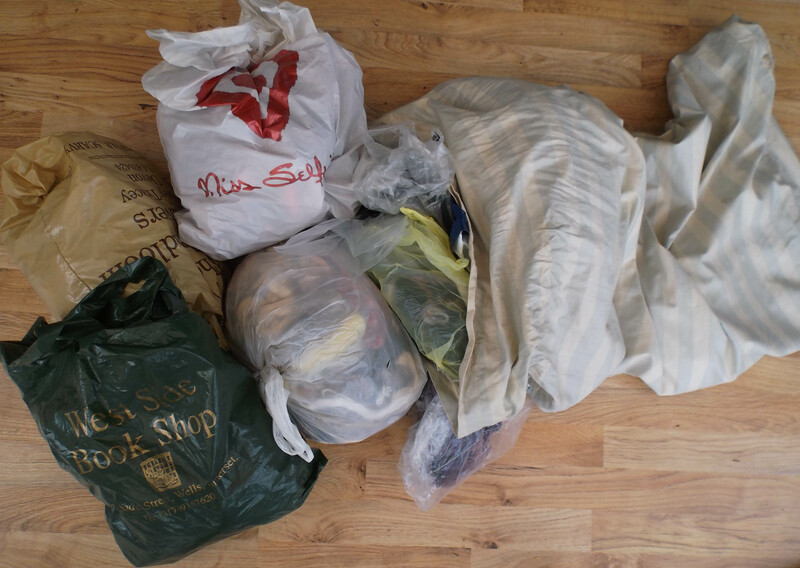 The sorted wools are indeed very touching – and if you ever take up embroidery, I think you should come and take some as they may have come from our grandmother! 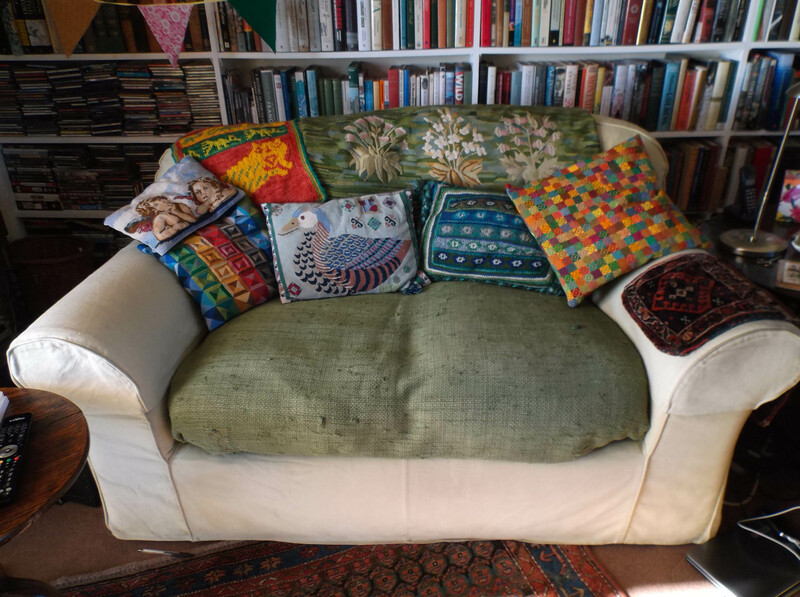 A lovely story and your sofa looks so welcoming. You have such a lovely blog and writing style. I don’t know how I came upon it (perhaps needleandspindle? ), but your articles are a delight. I saw Judi Dench interviewed fairly recently and she talked about her embroidery. I enjoyed hearing more. Your completed cushion is beautiful. Thank you for your kind comments – I am so glad you enjoy my posts. I am also so envious that you actually saw Judi Dench talking about her embroidery – so many of us would love to see more of what she does, and this article I quote is good, but not quite so vivid as actually seeing somebody speak in person. I wonder what she would think of what I’ve done with her pattern?!! 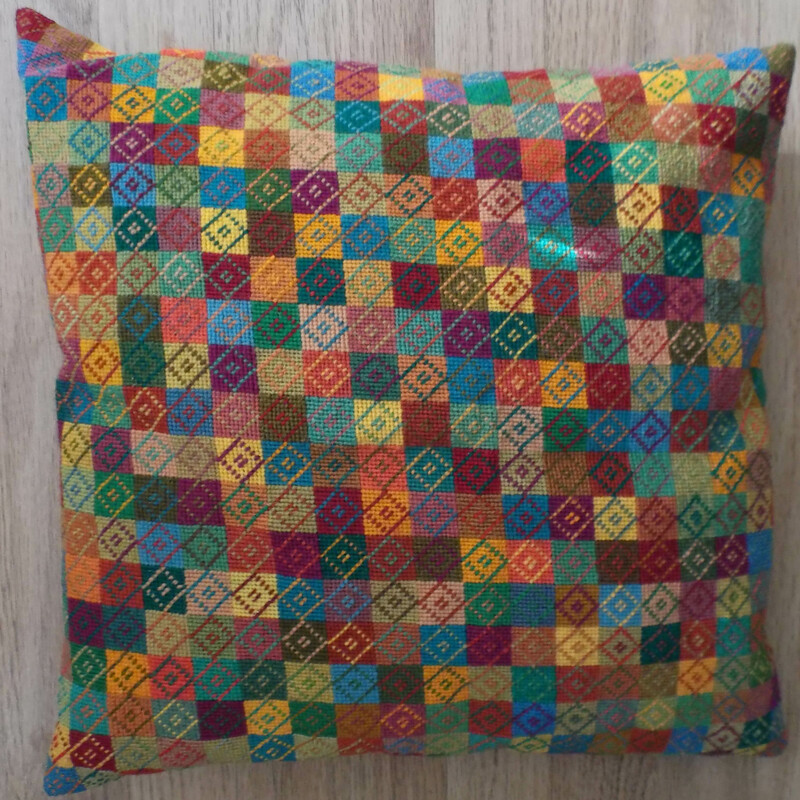 I love the colours and patterning in your cushion. I remember my mother having Pins & Needles and a little earlier (I think) Golden Hands, which I bound together for her using the bookbinding instructions in the magazine. Just recently I’ve been flicking through them and realised that in crafting terms there may be new materials and gadgets, but the basics remain the same. Also, the old magazines had fewer beautiful photos but were a lot better at instructions. Thank you, Anne. How intriguing to hear about your mother’s magazines. I completely agree that these old magazines are actually very good indeed – modern magazines just fill themselves with glossy pics and substance can be poor. My only quibble with my old copies of Pins and Needles is that the 80s style knitting they feature means sleeves are not set into the body – just looks so bulky. Nice that the yarns from your Mum didn’t get eaten. WOW, glad we’re over ‘that’…mothballs that is……..
You know I love that look you showed in the first few photos……haha, guess where I was at that time!! Thank you, Elizabeth. Yes – I noticed that about the different colours – so strange. I wanted to photograph the cushion against a very neutral background which happened to be the kitchen floor – and the pic came out quite a different colour! 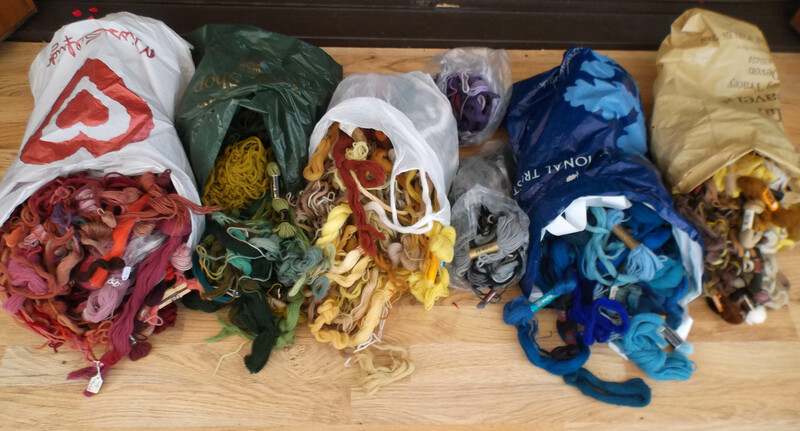 I hadn’t noticed that the plastic bags colour matched the wools inside until now !!! I enjoyed so many things about this post. Judy Dench doing handwork that is not knitting, you waiting for your new magazine in the 80s, an old project finally done and accumulating new stories as an everyday thing in your home, old stash rediscovered, the styled and unstyled couch. Your stories stretch around time and experience, history and recollection. This is a great place to visit. Everyone can have some of our sun, there is just too much here for us. I’ve been meaning to write this post for a couple of weeks, mulling it over as other things happened. Thinking over the constituent parts. And it is strange how some stories just come together – they have their own voice, as it were. I think this is one of those – so glad you enjoyed it. How simply lovely!!! 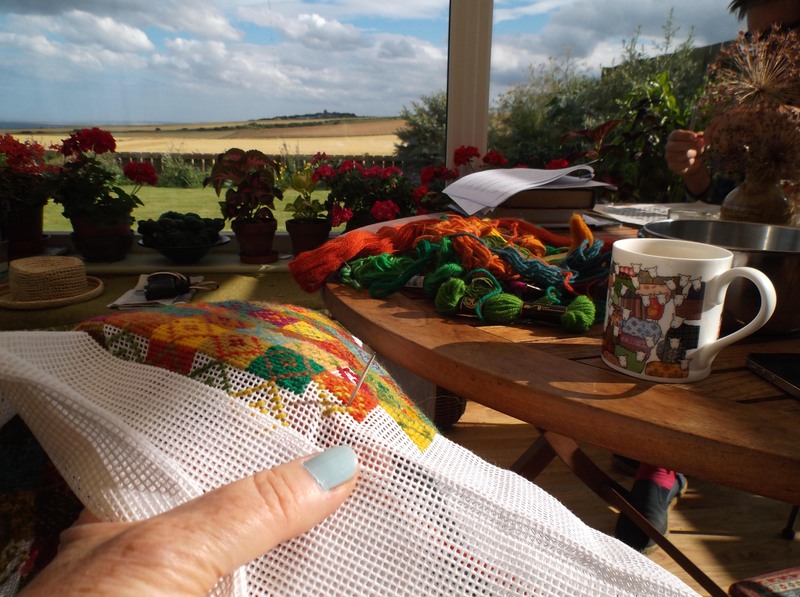 – I love Judy Dench and how gorgeous that she loves handcrafts… Your finished cushion is perfect! Thank you! I’m so glad you enjoy my blog.